We have been doing this procedure at the Glendowie-St.Heliers Veterinary Clinic for many years now. A Tibial Plateau Levelling Osteotomy [TPLO] is a procedure to correct a rupture of the cranial cruciate ligament in the knee of dogs. We have done over 200 of these procedures since 2003 and the success rate of this surgery is extremely high. There are now a number of so-called “tibial plateau leveling procedures” done, all of which have their own abbreviations: TTA, TTO and TPLO. Whilst it is tempting to think one must be better than the other, the end result from all of these procedures is very similar and all achieve good outcomes. The technique chosen is simply the one the surgeon is best equipped and qualified to perform. The TPLO however, is accepted as the gold standard and is known to achieve the best return to normal function of all the cruciate repair procedures. This injury is common in both dogs and people. The anatomy of the dog knee is unique however and requires a different approach to repair than what is done for people. The canine stifle is different because its platform [the tibial plateau], is not flat as it is in people. It is backward-sloping. This is illustrated in the xrays below. So,the long bone [femur] in the canine knee rests on a backward-sloping platform. As a result the tibia underneath has a tendency to slide forward under the femur. [This is referred to as “tibial thrust”]. What stops it sliding forwards in fact, is the cruciate ligament. The cranial cruciate’s role is to tie the two bones together and prevent instability in the knee whether the dog is standing or running. When this ligament snaps, the tibia slides forward under the femur, causing instability every time the foot is touched to the ground. The canine stifle is constructed like this because the hind leg of the dog is crooked from side on, not straight, and this slope puts the platform in a relatively level position when the dog is standing at rest. It is also thought that this slope allows the dog to move its lower leg forward faster than us, making dogs quicker runners than us. And you only have to see them running in the park to realise how true this is!! When running though, this backward slope also puts a lot of pressure on the cranial cruciate ligament to counter the tibial thrust and keep the two bones spliced together. Over time the ligament may weaken due to constant wear and tear from these dogs charging around- as dogs do! 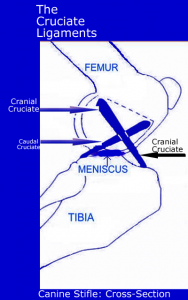 Hence rupture of the cruciate ligament appears to be a degenerative process in the dog, possibly due to the constant stress of countering this tibial thrust. In humans, cruciate rupture seems to follow a single traumatic event; although this happens in dogs as well, more commonly rupture is probably secondary to the degenerative process that has been occurring in their knee over a period of time. The conventional approach to repair of this injury in dogs has been to try and replace the ruptured ligament by putting in a new artificial ligament or a new tissue graft to replace the ruptured one. 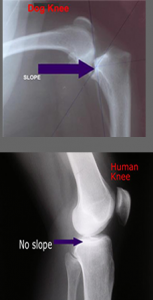 The success rate with this approach is often limited because the artificial ligament can not withstand the constant stress of tibial thrust; eventually the artificial ligament or graft loosens or even breaks and instability returns to the knee. Arthritis in these joints is often very progressive and the joint becomes thickened with fibrous tissue as the joint tries to stabilise itself. This greatly reduces the range of motion of the joint and many of these dogs end up lame and arthritic. The approach with a TPLO overcomes this tibial thrust problem. By doing an osteotomy [a bone cut] and rotating the platform into a flat position, we give the long bone a flat platform to rest on – much like ours. There is now no tibial thrust because there is no longer any slope. These dogs suddenly have a stable platform and a stable knee. With this procedure, there is far less progression of arthritis and most dogs return to normal activity because they have a far greater range of motion in their joint i.e. they can straighten and bend it fully. We thoroughly recommend this surgery in the dog for repair of ruptured cruciates because of the more natural return to function that it achieves, and the dramatic reduction in arthritis that ensues. Of all the repair techniques available, the TPLO is recognised as the gold standard and conveys the best return to normal gait. The cost ranges between $3800 – $4200, hopefully putting it in reach of most owners and making it affordable surgery for the active dog.